Universal City will consist of suits sizes that will range from 1 bedroom to 3 bedroom with open concept, floor to ceiling windows, 9 foot ceilings where applicable and engineered hardwood flooring. 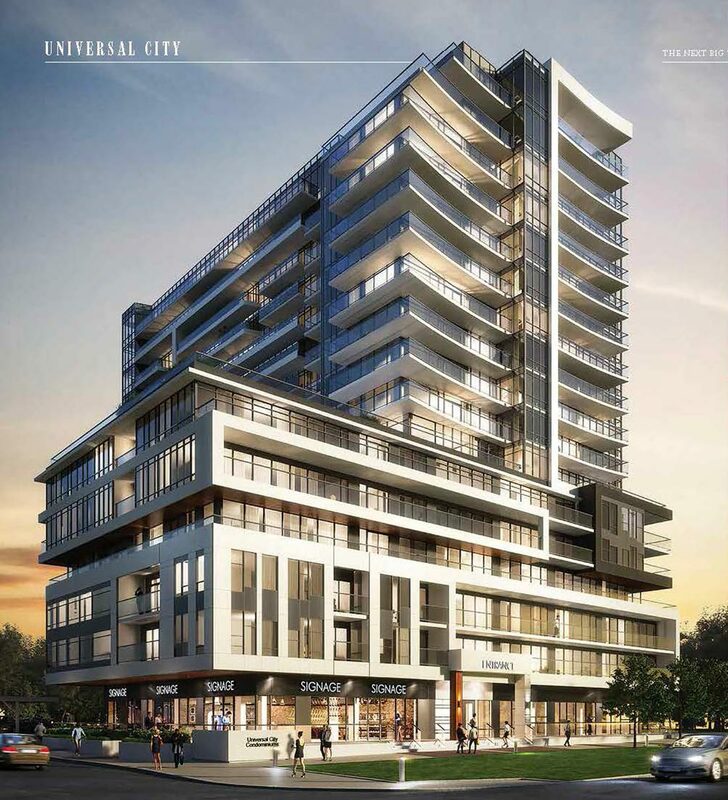 Universal City Condos 2 is located at 1474 Bayly Street, Pickering in Bay Ridges’ neighbourhood is by Chestnut Hill Development, one of the top real estate developers in the market. Universal City Condos 2 will comprise a mixture of one-bed, two-bed and three-bedroom units. Additional details about the number of floors, units, unit sizes and more are yet to be released by the developer, so stay tuned. This is the second tower out of the planned collection of 5 towers in Universal City’s master planned mixed use community, and it will certainly be good news for those who missed out on the first tower. Actually, Universal City Condos 1 sold out just within weeks! The estimated completion date for Universal City Condos 2 is 2021, with VIP Launch scheduled for fall 2018. The building will include retail and commercial space that will be located at ground level plus amenity space allocated in the entire building. Amenities will include 24-hour concierge, electric vehicle parking, fitness facility, ultramodern kitchen together with party room, outdoor landscaped terraces along with barbeque stations and cabanas, fire pits, and more. The condominium is located in place where transit options can be conveniently accessed. The Pickering GO train as well as the bus station – both of which connect to the Union Station, the York University, Newcastle and other destinations, are within a minute’s walk from the site. A short walk from the condos are additional bus stations, providing easy access around the area and neighbouring regions. With Ontario 401 expressway just seconds from the condos, motorists can also get access to the eastern plus western areas conveniently. The condo site is close to prestigious schools, The Pickering Recreation Complex, big box stores, shops, eateries and transportation. Pickering Town Centre – the largest shopping mall in Pickering area – is merely 3 minutes’ drive away. It is located a short walk to several scenic parks, most of which offer various facilities like playgrounds, sports, picnic tables and waterfront trails among others. The parks include Alex Robertson Park, Bay Ridges Kinsmen Park, Beachfront Park, Douglas Park, David Farr Park, Diana Princess of Wales Park, and Glengrove Park. The project site is also a few minutes’ drive to the picturesque waterfront. Pickering is actually considered to be among the areas designated for growth in the Province’s Places to Grow Act whereby the plan designates particular places for growth through strategic planning. The town is flourishing and poised to be the next hot spot to reside in GTA East. As the city experiences growth in infrastructure development, it will obviously become a major hub for jobs as well as population growth. The population is expected to increase from 96,089 to 190,000 by the year 2031. An international airport is also planned. Universal City Condos 2 is ideal for both young and old. It offers you a rare investment opportunity.